Simple hand wine bottle corker. 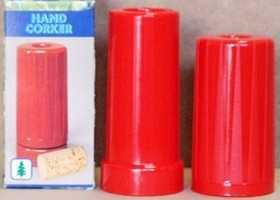 This simple hand corker makes it simple to seal your your freshly made wine. A sterilised cork is placed in the tapered chamber on body of the corker and is forced securely into place in the neck of the bottle. The outer case is either pushed down or forced down with a gentle tap from a large mallet. If using silicone treated corks, do not soak them first, just wash them briefly to remove any loose particles.